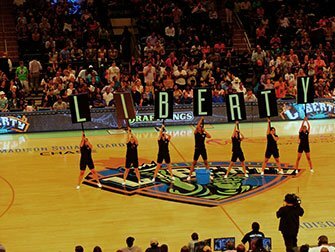 Buy New York Liberty basketball tickets safely and easily online. New York Liberty are New York’s all-female basketball team. They play in the WNBA (Women’s National Basketball Association). New York Liberty play most of their home games at Westchester County Center in White Plains. This is the same stadium as the Westchester Knicks: a minor-league affiliate of the New York Knicks. Some of their games also take place at Madison Square Garden. 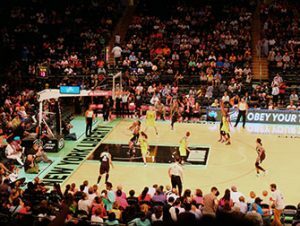 New York Liberty, founded in 1997 were one of the first teams to play in the WNBA. They have been successful since the beginning and regularly qualify for the play-offs. New York Liberty play during the NBA offseason, from May/June to September/October. If you’re in New York over the summer, and want to see a basketball game, this is a good option. If New York Liberty aren’t playing, check if you can get New York Knicks tickets. Buy New York Liberty tickets now, pay no service fee and get free shipping (e-tickets) or choose free local pickup! 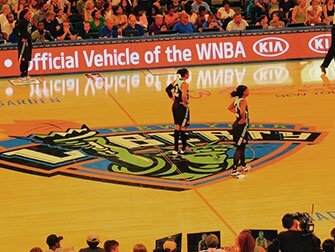 Buy tickets for New York Liberty by checking the schedule here, where you can search all available dates. The tickets can be paid for by credit card and sent to your home address or email. You can also choose to pick up the tickets in New York, for free. If you can’t print out your e-tickets, you can also drop by the office and someone will be there to help. The office is centrally located, near Times Square. Buying e-tickets is the fastest option, and local pick-up is the best option for all other tickets. Both options save shipping costs, so I highly recommend either. Your tickets are 100% guaranteed authentic and will be delivered on time. Where Should I sit in Westchester County Center? New York Liberty tickets are not expensive so I recommend choosing the best available seats, in the middle of the court. Choose, for example, seats in sections 10 to 40 on the east or west side, or even court-side tickets! How do I get to Westchester County Center? The easiest way to get from Manhattan to the Westchester County Center is by train. From Grand Central, take the Metro North Railroad’s blue Harlem-line to White Plains. You can buy a roundtrip ticket at the station. The train journey takes around 40 minutes. Then you can walk to the stadium in around 10 minutes. I would suggest arriving 30 minutes before the game. After the game you can take the train back to Manhattan. Eric’s Tip: Women’s basketball? Yes! Are you looking for an evening out for the entire family, or are you a basketball fan? Then I highly recommend New York Liberty. A Liberty game offers American-style entertainment! You needn’t come early, 30 minutes before the game starts is enough. A game is 4 x 10 minutes, but lasts around 2 hours.